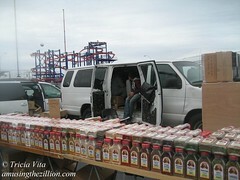 We’re marking the year’s end with a look back at ATZ’s Top 10 Coney Island News Stories of 2011. We’d also like to take this opportunity to toot the horn for New York City’s local blogs, which have become a mostly unheralded source of breaking news and features for mainstream media. Please visit our links page for a list of some of our friends and faves. Thank you to the bloggers and journos who have linked to our stories in 2011. Thanks to our readers for your comments, both online and in person. Happy New Year to All and Happy New Year to Coney Island! 1. The top news story of the year was the victory of local Mom and Pops over a plan to gentrify and corporatize the Boardwalk with eateries run by a Miami restaurateur and French food giant Sodexo. After kicking out nine Coney Island Mom and Pops from City-owned property to make way for the newcomers, the park division of Italian ride manufacturer Zamperla did an about-face in October and offered multi-year leases to two local favorites — Paul’s Daughter and Ruby’s Bar. Even though all of the Boardwalk businesses weren’t invited back, we still count it as a rare victory for the City’s endangered Mom & Pops. It might not have happened if eight of them hadn’t banded together to take their case to court and negotiate a reprieve for the 2011 season. As we wrote in “Reversal of Fortune on the Coney Island Boardwalk”(October 20): We’re just glad some of the people in charge realized Coney Island is neither Miami Beach nor a corporate cafeteria before we lost all of our original, irreplaceable businesses and ended up with a shuttered Boardwalk. ATZ covered the year-long saga in numerous posts, including “Paul’s Daughter Dishes on the Boardwalk Brawl”(Jan. 13), “Coney Island Boardwalk 8 Lease Deal in the Works for 2011” (Feb. 15), “The Lowdown on Sodexo’s Sweet Deal in Coney Island“(March 3) and finally (and thankfully) “Paul’s Daughter Signs 8-Year Lease for Coney Island Boardwalk” (Dec 9). We hope everyone learned a lesson from this bitter chapter and can now move forward. 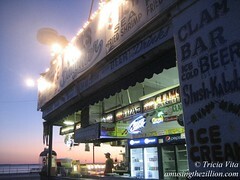 For a sneak peek at the new Boardwalk, which features genuine Coney Island and Brooklyn businesses, see #10. Meanwhile, some of the Boardwalk vets who weren’t offered leases, including Cha Cha’s and Steve’s Grill House, are seeking to relocate nearby. As the saying goes in Coney Island, once you’ve got sand in your shoes, you can’t get it out. ATZ’s #2 news story based on page views was our annual ride census. 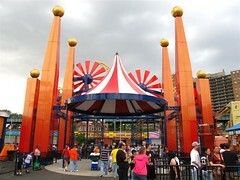 At the start of the 2011 season, the Coney Island ride count was Central Amusements International’s Luna Park (19), Scream Zone (4) and Cyclone (1); Deno’s Wonder Wheel Park (22); Eldorado Bumper Cars (1); Polar Express and 12th Street Amusements (5), and McCullough’s Kiddie Park (12). In mid-June, McCullough’s had to reconfigure the park and remove two kiddie rides when a sublease on property owned by Thor Equities expired. Coney Island finished the season with 62 rides. The total number of rides is expected to go up with the opening of CAI’s Speed Zone in 2012, which will feature Go Karts and a Sky Coaster. ATZ has been doing an annotated ride census since the closing of Astroland’s 24 rides put the tally at “Coney Island Ride Count: Veteran Ride Ops 40, Joe Sitt 10!” (ATZ, June 4, 2009). Back then, the dwindling number of rides and the empty lots had people asking “Is Coney Island Closed?” and gave rise to the marketing slogan “Coney Island: Really Fun, Really Open.” In 2011, the number of rides and operators in Coney Island was still a surprise to people, since most Coney news coverage focuses on the new rides at Luna Park and Scream Zone or the landmark Cyclone and Wonder Wheel. As we explain in the comment section of the census: Coney Island is NOT and never has been a single operator park like Disneyland or Six Flags. Historically, Coney Island’s unique character and vitality comes from the fact that it is a neighborhood with many individually owned and operated amusements. Let’s hope we can keep this tradition. In April, ATZ broke the news that Men in Black 3 had leased Coney Island’s oldest building, the Grashorn, from Thor Equities and rescued it from oblivion. The production crew fixed up the gutted interior of the vacant building located at Surf and Jones Walk to use as their location headquarters. Over the past two years, the Grashorn Building had fallen victim to squatters, blight and burst water pipes. Sideshow operator John Strong as well as two different arcade owners tried but failed to lease the space from Thor. The building, which dates back to the 1880s, remained shuttered and vacant during the 2009 and 2010 seasons. In May, Men in Black 3, which stars Will Smith as Agent J traveling back in time to 1969, filmed on the Coney Island Boardwalk, which was outfitted with retro-looking carnival booths. Then in June, HBO’s Bored to Death transformed the Grashorn into the Susquehanna Hat Company for an episode that aired this month in which Stacy Keach played the shop’s proprietor. With the exception of the film shoots, Coney Island’s oldest building remained vacant in 2011, though squatters were again locked out last week. The buzz about the displaced Aqueduct Flea Market relocating to Joe Sitt’s empty lots in Coney Island, which ATZ first reported last December, continued through the first quarter of 2011 as Queens vendors showed up to check out the new lot. When the flea market called the BK Festival opened in May we photographed it for “Thor’s Coney Island: Aqueduct Flea Vendors Make Dismal Debut.” It was not in any way “like a state fair,” as hyped by the festival management in advertisements, nor did it feature “upscale product,” as hyped by the New York Times in a puff piece on Joe Sitt. Like Thor’s 2009 “Festival by the Sea,” the new flea market billed itself as a festival because a flea market is not a permitted use on this property in Coney Island. 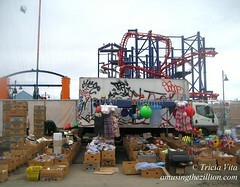 In response to ATZ’s query about the zoning, Purnima Kapur, Brooklyn City Planning Director, confirmed in an email: “The C7 zoning district in Coney Island does not permit Flea Markets as a permitted use; however small scale retail and restaurants are permitted in addition to amusements.” There are Use Groups A, B and C, with A being for Amusements, and a formula for their allocation. But of course, no one reads the zoning and in any case the City rarely enforces its own zoning against flea markets in Coney. To people who say it’s better than an empty lot, ATZ says it’s a desecration to have a flea market on hallowed ground where the Tornado Roller Coaster and other amusements thrived for more than 100 years until Joe Sitt bought the property and evicted the remaining amusement operators. In April, Rooftop Films, a nonprofit which has been showing underground films outdoors in New York City since 1997, tweeted the news that it would bring free outdoor movie screenings to Coney Island’s beach in the summer of 2011. The Coney Island Development Corporation (CIDC), NYC & Company and EpixHD partnered with Rooftop to launch the new Coney Island Film Series. The event drew over 3,000 attendees to its eight movie screenings featuring such popular films as Saturday Night Fever, Annie Hall and Moonstruck along with pre-show entertainment and contests. Flicks on the Beach was a welcome new addition to Coney’s roster of free summer-long events, which include Friday Night Fireworks, Karaoke on the Boardwalk, the Coney Island Dancers and the Seaside Summer Concert Series. Last January, Luna Park jumpstarted the process for job seekers by posting some plum jobs on Craigslist. They were looking for an Assistant Operations Manager to help oversee the park operation (salary of $30,000-$40,000 per year) as well as a Seasonal Assistant Operations Coordinator and a Seasonal Assistant Administrative Manager (pay rate of $14.45-$19.25 per hour). Information about entry level jobs such as ride operator, game operator, ticketseller and retail sales was also available on the park’s website. In November, a press release from the Mayor’s Office noted that over 400 jobs were created by the new amusement parks with approximately half filled by local residents. Among the notable deaths in 2011 were Rabbi Abraham Abraham, the leader of the Ice Breakers, whose synagogue was the beach, and Andy Badalamenti, who operated such legendary rides as the Tornado and the Bobsled, and lived in the house under the Thunderbolt roller coaster when he worked as its caretaker. 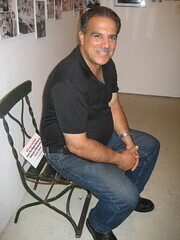 This photo of Andy trying out a 120-year-old chair from Feltman’s Maple Garden Restaurant was taken at the Coney Island History Project on August 29, 2008. Astroland was set to close forever on the next weekend. After winning a one-year reprieve, many of us felt despondent about not being able to save the park again. But Andy wasn’t about to give up hope. He had dreams of moving the rides a few blocks away and was busily talking up the idea. Rest in peace, Andy. Coney Island misses you. In November, ATZ attended an AIA panel on “Planning the Future of Coney Island’s Amusement District,” at which an audience of architects and Coney Island regulars got a sneak peek at what the Boardwalk might look like in 2012 and beyond. Luna Park’s plans for Go Karts and a Sky Coaster in a new “Speed Zone” were unveiled along with the Boardwalk businesses renderings for new stores in 2012. Among the designs shown in the photos are Ruby’s Bar and Paul’s Daughter, as well as Brooklyn Beach Shop, Lola Star and Nathan’s. The rendering for Paul’s Daughter, a Boardwalk icon founded in 1962 as Gregory & Paul’s, shows the spruced up Burger statues on the roof and what appears to be new hand-painted signage along the bottom. Like Ruby’s, Paul’s Daughter signed an 8-year lease with Zamperla this month, and will be back along with a mix of other Coney Island and Brooklyn businesses. The Boardwalk will not be gentrified or corporatized after all! It’s looking like a Happy New Year for Coney Island. Yes! And it’s interesting how some of the small business owners whose stories ended happily in 2011–St. Marks Books, Caffe Vivaldi, Ruby’s, Paul’s–had the help of fans and supporters. Could it be a trend for 2012? It has been a rough road for awhile but knowing that Paul’s Daughter, Lola Starr and Rubys will grace the boardwalk for some years to come is great news. also, the Grashorn Building being saved, leased and partially restored is wonderful. Maybe if more production companies see the potential of using Coney as a backdrop, or movie set more of the Original Coney will survive. I’m sure people remember the 1953 award winning movie Little Fugitive which when seen brings you right back to the old Coney Island as it was. The people of New York and the other ZILLIONS need Coney Island. Can’t wait to see Coney Island in MIB3. The release date is May 25, 2012! You rock, Tricia. Exceptional, eloquent, informative reporting – thank you. Thank you and Happy New Year, Mr. Jones!